Take a look at Susan, she is a sales order processor at Cronus International, and every day she starts with checking the quotes from previous day, making sure they are ready for making into orders. She then checks for any open orders which can be released for shipping and invoicing. Then she checks the orders ready to be shipped, then those that have only partially been shipped, and pays special attention to those that have been delayed. When all this has been finished, she takes a look at the returns and handles them, if any. 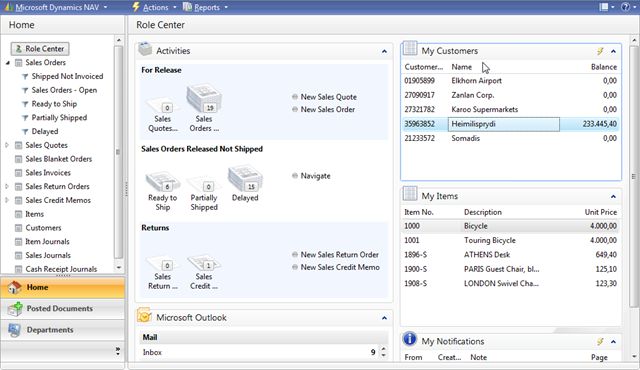 In Classic interface of Microsoft Dynamics NAV, this required a lot of clicking around, filtering and came with high probability of lost productivity: Susan would set an incorrect filter, getting an empty list instead of one with 25 orders requiring her attention, which she would frequently find out only at lunchtime when her boss called her in frustration asking here why these customers haven’t already been served. Then she would burst into tears, because she never really understood how to set all those filters—there were so many of them. She immediately sees where to click, and getting anywhere is always a single click away. No more frustration over filtering—she never actually has to set a single filter, all of this is taken care of by the RoleTailored user interface. Before, if she saw an empty list of orders, she was never sure whether the list was empty just because it was empty, or because a wrongly set filter was making it look empty. Now she is always sure. She never makes mistakes, she never misses a single order. She rules. She feels great. And it’s not about Susan. It’s about every single employee in the company. For each of them, their home page, or Role Center, tells them exactly what they need to do, helps them prioritize their tasks, see and respond to action items. No more time lost on searching for correct button, or wondering whether right filter was switched on. The system helps everybody focus on their job, rather than focusing on and handling the software. RoleTailored experience didn’t just come out of blue, as an experiment that Microsoft has decided to conduct. Actually, Microsoft has spent several years researching how users use systems, what they do, where they spend their time, and how they think and react when using software. They researched companies and their processes, and identified groups of users, called roles, so that a viable customer model could be built right there, into the user interface and the application itself, so that every new deployment of Microsoft Dynamics solutions can go smoothly, and provide faster adaptation time, less time spent on training users for new interface. The product of this is the RoleTailored interface. If you want to learn more about RoleTailored experience and how it enhances user productivity, I suggest that you read the Microsoft Dynamics RoleTailored Business Productivity whitepaper. I also suggest you read the blog post about RoleTailored experience, that Vibor Cipan, a member of Dynamics User Experience team in Copenhagen, and a good friend of mine, posted on his blog UXPassion.com. I also plan to cover this topic in a lot of detail here on my blog, so stay tuned for more content in the following weeks. Previous PostLook me in the eye!Next PostWhat does a Microsoft Dynamics consultant do?